Our first travel destination in 2006 was Hawai'i, thanks to my wife's continuing love affair with the island state. This time the official reason was for my wife to present a poster on something that is way beyond my comprehension. Anyway, not one to let any trip pass, especially the free ones, we decided to add a third island, Maui, to our been-there bucket. Our trip started off with a long boring plane journey to Maui. Despite the best effort of the airline, the magic of time difference (which we hardly ever experience living so west) left us with enough daylight to start sight-seeing right away. We covered the Kahekili Highway on the north-east corner of the island in little over 3 hrs on the first afternoon. This, along with its counterpart on the south-east corner, is generally discouraged by the rental car companies and guide books as the roads are very narrow and winding. But they are paved most of the way and unless it is dark or pouring, there is no reason why a regular passenger car can't handle these roads. 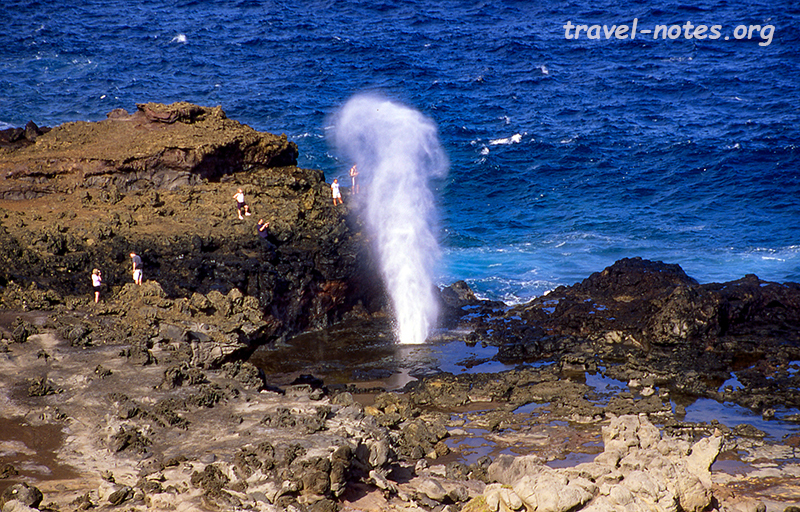 The must-see sight on the highway is the Nakalele blowhole, which we were lucky enough to catch in its full glory. 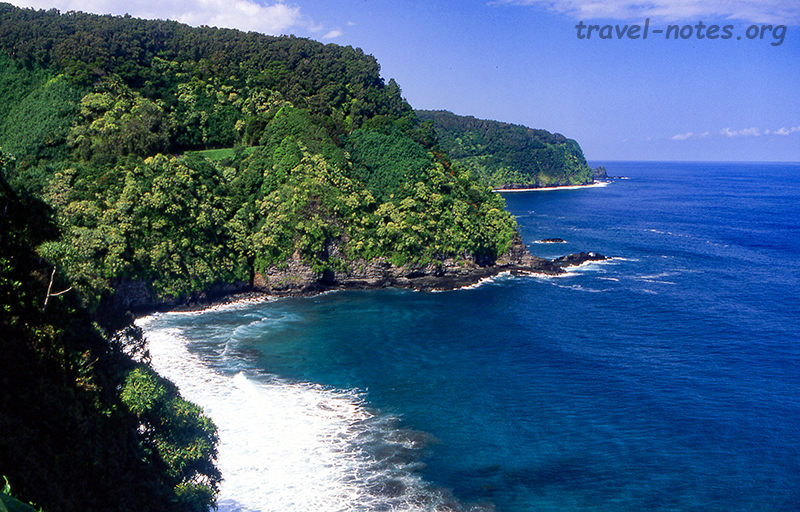 The agenda for the following day was to drive to Hana along the picturesque "Hana Highway". But since the day turned out to be bright, clear and sunny, we decided to add a quick trip to the Iao Valley State Park before the drive. 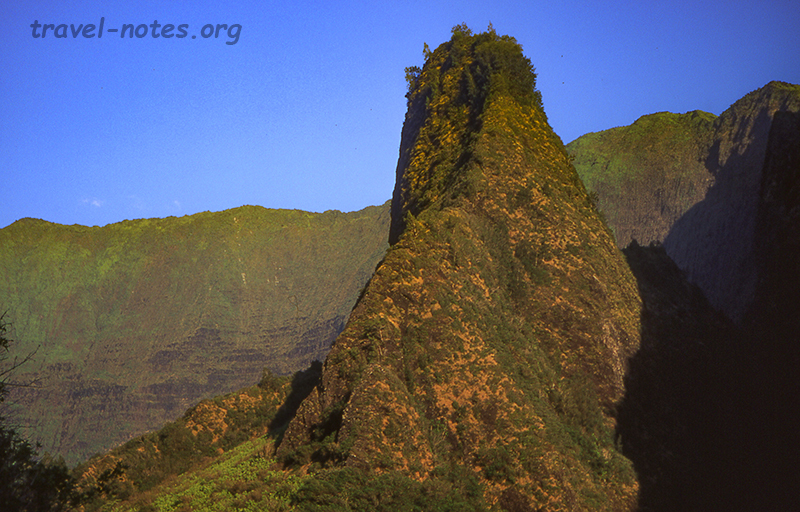 The state park, located 6 miles west of Kahului (our home for the first night), is home to the Iao Needle, a 1200 ft tall volcanic rock pillar rising dramatically from the valley floor. The site was a witness to King Kamehameha's bloody take over of the island on his way to being the first king of all the islands. We took about four hurs to cover the 54 miles from Kahului to Hana. The luxury of staying overnight at Hana gave us a chance not only to take the drive at a slower pace and but also to explore the Oheo Gulch region, a lush green gulch lying 45 minutes beyond Hana and within the bounds of the Haleakala National Park. If you ever make it this far, you should take time to explore the lush bamboo forests of the region - the one good way to do it is to take the 2 mile hike (Pipiwai Trail) to the Waimoku falls. If the 400 ft fall doesn't amaze you, the walk through the thick bamboo forests definitely will. The following day, we drove the other out-of-bound highway, the Piilani Highway (Route 31) on the south-east corner of the island. This road was more bumpy, but thankfully more deserted than the rest of the scenic drives. For our efforts, we were rewarded with the views of the back side of the 10,000 ft Haleakala volcano, the only side that can be seen from the land. 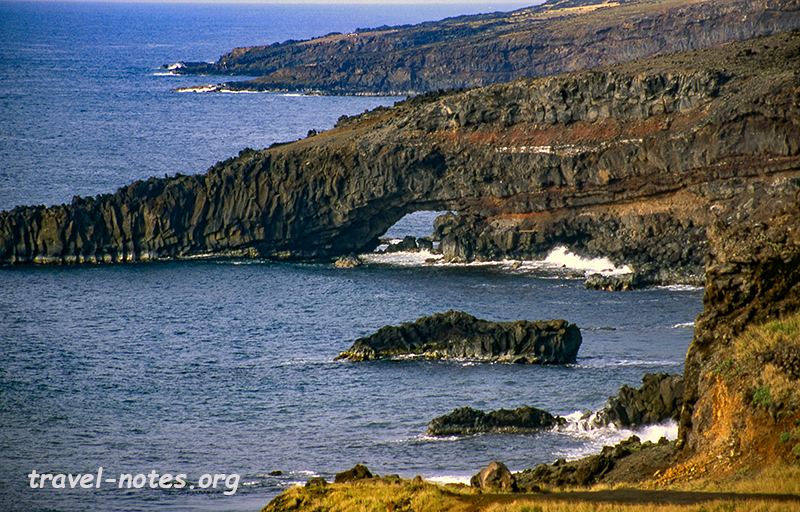 The change from lush green setting on the Hana Highway to the semi-arid surroundings of the Piilani was quite dramatic, so was the sea-arch that we spotted by the road side. No trip to Maui is complete without paying the sunrise homage to the volcano. We got up at 4 am to knock off the final must do. It was a winding two hours drive to the top from Kahului. Apparently, the road to the top of Haleakala has the highest elevation gain in the shortest distance anywhere in the world. Unfortunately, our luck with the weather ran out and we never saw the much photographed sight of the sun rising over a carpet of cloud. But whatever we saw was dramatic enough to rank as the best sight of the trip making the entire trip, let alone the trouble of waking up early, worthwhile. Click here for more photos from Maui, Hawai'i.